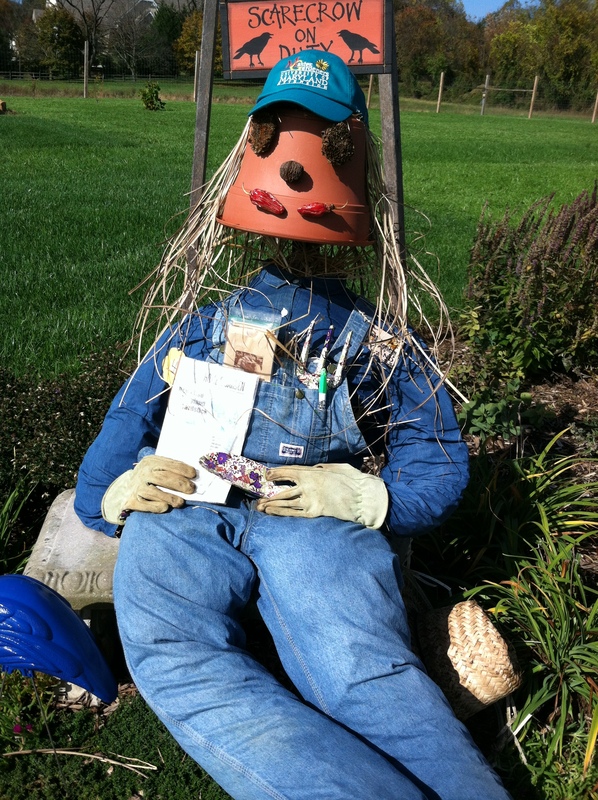 Scarecrows are fun to create from found materials in all shapes, sizes, and materials! 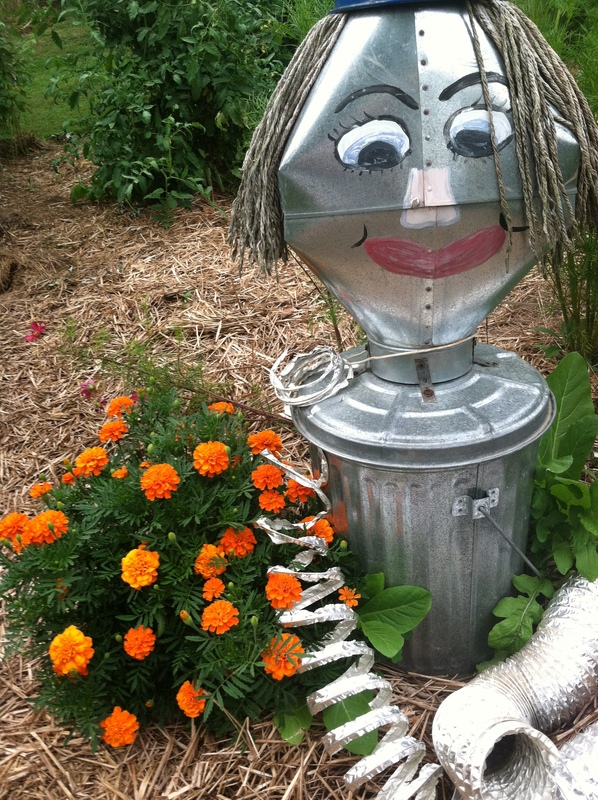 Fabricated from a left over metal trash can and dryer vent pipe, and sheet metal findings from a house installation, my scarecrow was a fixture in my garden. When a recent blog posting of the Pennsylvania Horticultural Society announcing a scarecrow contest hit my computer, I was all over it! I gussied up my 5-year-old scarecrow a little, adding a blue watering can, and pulled a wiry red wig out of the trash can (my daughter is into costuming), and added their insignia (PHS harvest festival) to the front of my scarecrow. She was ready for primetime and I clicked a few ‘posed’ pictures of her. 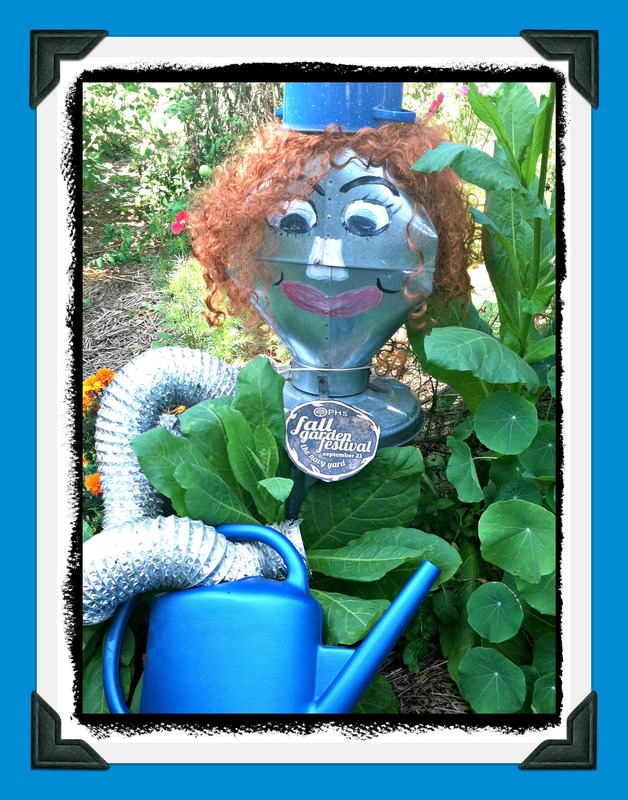 A week later, I received word that my ‘garden goddess’ won the contest and was happy for her! If you ever get a chance to go the family friendly PHS Harvest Festival held every fall, the event is fantastic. 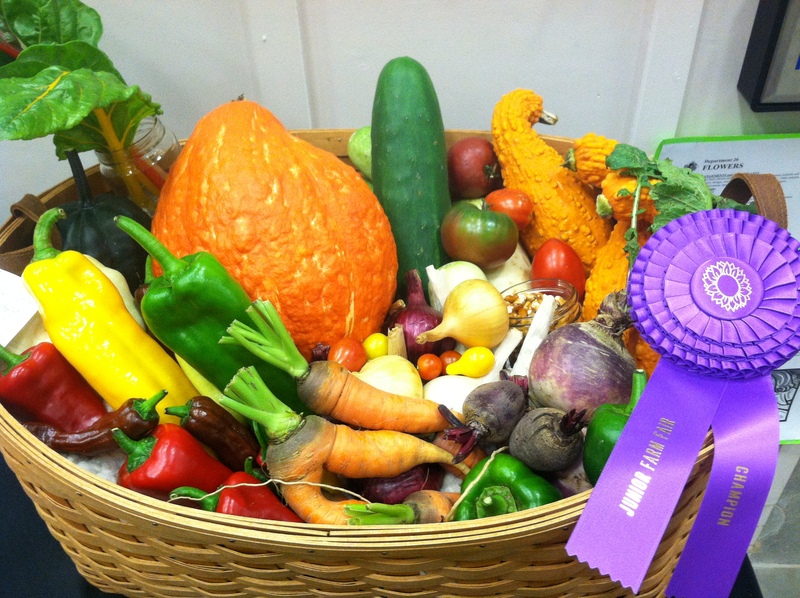 I have judged the veggie displays in the past and the displays have been over the top with the varieties and colors. Their blog is http://phsblog.org/2012/10/02/contest-winners-celebrated-at-the-phs-fall-garden-festival/ On the PHS blog, you can see pictures of the competition of “Garden Giants”, larger than life vegetables, and “Garden Bounty”, showcasing generous displays from local gardens. The PHS is a great organization that puts on the incredible Philadelphia Flower Show every spring, that if you have never been, will knock your socks off. If you want more information about this wonderful society, go to http://phsonline.org/events to check out their list of event and happenings. The basket below is from my recently judged fair closer to home at the Hereford Farm Fair. This fair is for entries from people 18 and under. Quite impressive! That is the best scarecrow I’ve ever seen!!!!! Love the creativity.